To unforgivably botch something great, if all of humanity’s problems stem from man’s inability to sit quietly in a room alone, I’m starting to believe that all of Smitten Kitchen’s problems stem from my inability to leave exquisitely simple things like berries and cream alone. Or maybe it’s about me being unable to sit in a room alone with strawberries and cream and not eat them? One thing is clear; I think we know better than to entrust me with the work of great philosophers ever again. I’m sorry, Pascal. Let me rewind. Because my son has been going to a day camp across town this summer, I’ve had a lot more excuses to swing by the big Union Square Greenmarket on my way back to poke around for inspiration, which is about as close as I’m probably going to get in Manhattan to a summer on the farm. I’ve learned a lot. As I gasped a couple weeks ago, I didn’t even realize the New York grew such great apricots, or that their season is so long. I’d always associated prune plums with late August and early September, but they’ve been out for weeks now. And, most excitingly for me, I always thought of strawberries as a June thing — they come early, leave quickly, and are often good but rarely transcendent. So, it’s been a treat to learn that the best strawberries, the tiny wild ones, show up later in the summer and are, as far as I’m concerned, the platonic ideal of what a strawberry should be — sweet, delicate and fragrant, with no two exactly alike. It also means that we’ve been on a berries-and-cream kick for dessert this past month. I like that we’re having a bowl of berries each night; my son likes that we’re having a bowl of whipped cream; my husband just likes that we’re having dessert. Everybody wins. But I had another idea; I wanted more. Which brings us back to the beginning — this is where all the trouble begins. Though hear me out: If there could be anything better to me than strawberries and tangy brown sugar softly whipped cream, it would unquestionably be those two things with bits of cookies on top, graham crackers, specifically. I’m definitely on a crumb kick this summer; once I realized I could separate crumble toppings from fruit crisps and coffee cakes, store them in a jar for weeks so to apply them wherever I wished, whenever the craving struck, I went down a streusel-scattered rabbit hole. There have been buttery cinnamon crumbles, pecan sandies crumbles and now this: honey and brown sugar-scented graham cracker crumbs. They’re ridiculously easy to make. They’re also ridiculously easy to eat. And although you could argue that strawberries and cream need no improvement, I find it impossible to believe that these don’t pull it off. This recipe will yield about 1 1/3 cups crumbs; the cream will yield a little under 1 cup and This whipped cream is adapted from Nancy Silverton’s version, which is genius because the addition of sour cream or creme fraiche ensures that doesn’t deflate in the fridge. I.e. you could make a jar of this and use it over several days. I’ve kept it as long as 4 days without any deflation. I thought I’d won the whipped cream lottery. The addition of dark brown sugar does make it a little beige, but the flavor combination of brown sugar, sour cream and strawberries is one of my favorites, and well worth the compromise in color. Heat oven to 350°F. Line a baking sheet with parchment paper for easy clean-up (although the crumbs should not stick if baked without it). Place melted butter in a large bowl. Stir in brown sugar and honey. Add baking powder, cinnamon, cloves and salt and stir to combine. Add whole wheat or graham flour, stir again, then add 1/2 cup plus 2 tablespoons all-purpose flour. 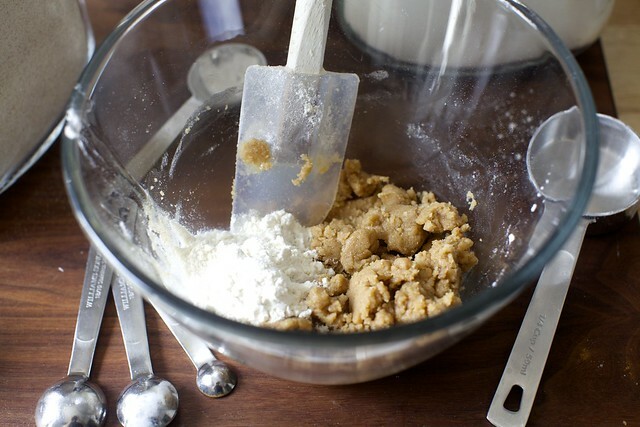 Stir until all flour is incorporated and mixture forms large and small crumbles. If needed, add the last tablespoon all-purpose flour to achieve this. Spread crumbs on baking sheet. Bake for 5 minutes, then stir them around so that they evenly bake. Return crumbs to oven and bake for another 2 to 3 minutes, until golden brown. Let cool in pan on rack. Crumbs will keep at room temperature in an airtight container for at least a week. Using a clean bowl and whisk (electric or a regular large one), whip cream and brown sugar until it holds soft peaks. Whisk in crème fraîche or sour cream, and vanilla. Keep chilled until needed. This whipped cream will last days in the fridge without needing to be re-whipped. Fill a small dish a little over halfway with strawberries, generously dollop on whipped cream and top with a couple tablespoons of graham crumbs. Repeat as needed and dig in. Aaah! You’ve done it again!! Strawberries & Cream will never be the same again in my house now too! :) Going to have to find some amazing strawberries this weekend! What a great idea! definitely trying this and I think I have mascarpone in my fridge. Yeah, I’ll be making this for my Labor Day activities. Would you suggest the sour cream addition to whipped cream as a stabilizer generally, for example in the use of cakes? Jessica — It really works wonderfully. Read more about it over here. I haven’t auditioned it on a cake yet, but I think it would definitely buy you a couple days (if not more) without worrying about the whipped cream disappearing, or just melting into the cake. “streusel- scattered rabbit hole”- this is why I keep coming back to your site…such fun writing…AND the great recipes! Thanks, Deb, and have a wonderful weekend with those strawberries. This looks perfect! I love to add Greek style yogurt to whipped cream for stability and flavor so I’m sure sour cream works the same way. This cream with graham crumbles would be lovely with roasted peaches as well… Oh I’m getting way too excited about this! Yes! I have all these ingredients in my fridge, so that’s tomorrow’s pudding chosen! Thank you for posting this. I share your inability to “keep thing simple” even with perfect strawberries and cream. 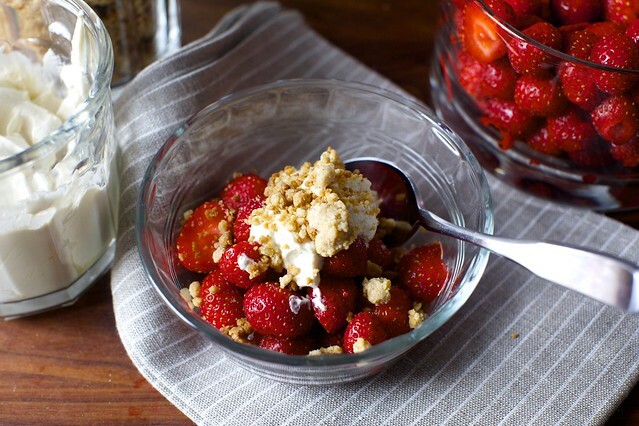 I such a fan of strawberries in crumble that i have try this quick take tomorrow! Deb – do you know what kind of strawberries they are? We were getting some little teeny Tri stars in August, but I think even those are done out here (Seattle). I agree that the little ones pack even more flavor than the bigger, early summer ones. oh. my. Lord. You always make my Friday afternoons the best. Graham crackers are my favorite for not-too-sweet desserts, but combining them with strawberries and cream is just genius! I can definitely see this being a winner with any berries – I think I’ll try it out with blueberries (my favorite). Yum! I live near the Red Jacket orchards and can attest to the fact that the whole stretch of the northern Finger Lakes/southern Lk. Ontario area is a fruit-grower’s, and -lover’s, stretch of Paradise. You should visit! We have a strawberry allergy in our household, but that isn’t going to stop me making this with peaches and, as soon as I see them in the markets again, plumegranate plums (another don’t-miss item). Kinda like the Momofuku Milk Bar cakes – I don’t think I would ever make a cake like that (too fussy), but some of the components are wonderful – liquid cheesecake for one – I like that you get a manageable amount out of it. Their Pie Crumbs are like a regular pie crust without all the drama. I sort of made up my own chocolate cookie and graham cracker ones. They make great parfaits with homemade chocolate pudding and whipped cream. Where do I get graham flour? Can I just crumble graham crackers? Forgot to mention I wanted graham cracker crumbs (made like a regular crust but baked in lumps like granola) to make a dessert with the aforementioned liquid cheesecake and fresh fruit – cheesecake in a bowl. I keep unbaked crumb/crisp topping in my freezer for throwing on whatever fruit makes it’s way home. My boyfriend recently asked for crisp topping cookies. Any idea how to turn all the crumbles into a cookie that tastes and looks like it came straight off the crisp? Those strawberries look so imperfectly perfect and I can’t stop thinking about the graham crumbles… Heavenly! This looks incredibly delicious. I love strawberries in the summertime. My family thinks I’m crazy because I love crumbles rather than shortbread bisquits for that all American strawberry dessert. I make a batch of almond sugar cookies and keep them in the freezer and crumble them over the strawberries and whipped cream. Thanks for the tip about adding sour cream to whipping cream for a stabilizer. I’ve used mascarpone cream for this but don’t always have it available but I always have sour cream! This looks AMAZING!!!! But I have to tell you – wild strawberries may be a NY thing. I have waited patiently at all of the farmers’ markets that I go to in Boston, and have yet to see them. Anyone else? Sweetening whipped cream with confectioner’s sugar also helps stabilize it because of the small amount of cornstarch in the sugar. I always used confectioner’s sugar for this purpose because it blends more easily into the cream, but the stabilization is an added bonus. In the ingredients for the crumbles, you list an amount of table salt and then say half as much for coarse. Shouldn’t it be twice as much for coarse salt? I was looking at one of the pictures where you show your ingredients, and have a question. 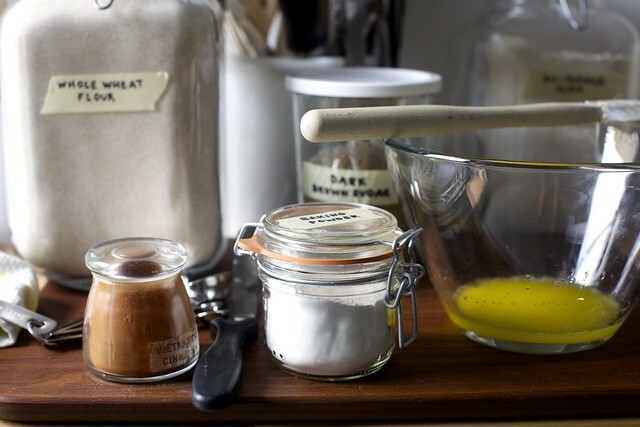 Where did you get the glass container that you store your wheat flour in? Also, I noticed that your baking soda is in a glass container. I keep mine in the container that it comes in. Do you recommend transferring it into a glass container? I’m looking to get new canisters for my baking supplies and am considering switching to glass. I’m making this tonight for dessert! Looks amazing! Vikki — I buy most of my clamp-top jars from Overstock.com, which sells a large range of them in different sizes from different brands. 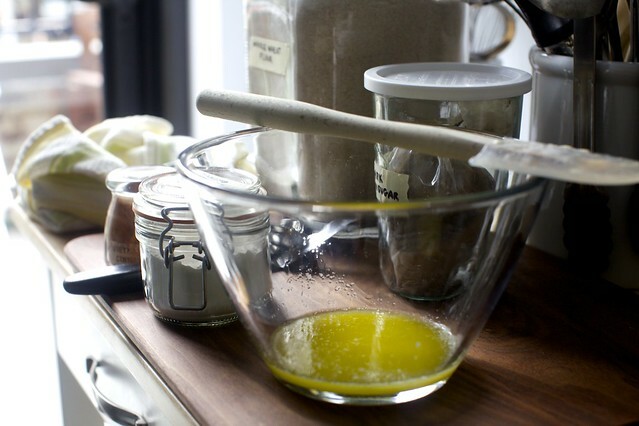 I began just using them for flours, but then moved onto sugars and then I liked how bright and open my small, overstuffed cabinets look, I slowly transferred everything else. I don’t think it’s mandatory to keep stuff in there (though if you’ve ever had little bugs in your pantry, not that I’ve ever, nope! you’ll be glad everything is sealed airtight and nothing can get in), but it definitely keeps things fresh and they endlessly reusable. Anyway, my baking soda is from Arm & Hammer, and the box doesn’t reseal. My baking powder is from Bob’s Red Mill and it came in a bag, so once it was opened, it was better to seal it in a jar. Mindy — Yes! And weirdly, I remembered that I’d written it wrong while making something else this evening and made a mental note to fix it… which basically means it never happened. Brown sugar whipped cream? With a sour cream stabilizer? Of course! How could I not have seen such a genius idea before? What a fab idea, I cannot wait to try it out. I will unpack my hand mixer immediately. (I am in the process of moving too) Thanks! Deb! I have sour cream (from your peach sour cream pancakes), heavy cream (from your strawberry cheesecake fools), and fresh strawberries on their last legs, plus two plums and two peaches. The strawberries were originally destined for a muddle puddle (okay, I realize now I sound obsessed with you, but you’re just so awesome with summer fruit) with a side of fruit galette, but with a coincidence like this, it would be downright negligent to not use the last of my other ingredients, given the opportunity. Right? My family thanks you; my thighs curse you. I keep thinking that with all the beautiful summer fruit, that should be enough sweetness to keep my happy… but THIS. LOOKS. INCREDIBLE. This looks sooo good and I love the addition of something crunchy in an otherwise non-crunchy textured dessert. Looks so yummy. I love this kind of dessert because you can switch it up to any fruit you have on hand or combine a few. I will do this dessert soon using blueberries and strawberries both yay! At our house we use crumbled store bought Italian amaretto cookies for this, and they will be hard to beat. Would this also work as a deconstructed apple crumble in the fall? Bake some apples with a little cinnamon, sugar and lemon juice and then serve with graham cracker crumbles and whipped cream. Meanwhile, serving strawberry recipe tonight for a going to college dessert party. As if you made the crumbles yourself!! This looks amazing! What a simple yet fantastic dessert! I had no idea about the late blooming summer strawberries, I will have to check out my local u-pick farms! this looks so good, can’t wait to try it out!! I started using sour cream, creme fraiche or Mexican crema in my whipped cream years ago, and very rarely just whip plain cream anymore. Sweetened or not, it tastes better with just that little bit of sour bite. I’m particularly fond of it in Eton Mess, which will also answer the “Is it possible to improve on berries and cream, not that it needs it?” question in the affirmative. Just macerate some berries (any kind of berries, or, really, any kind of fruit) with your optimal level of sugar, crumble up some plain crisp meringues, and layer with whipped cream like a parfait. Perfect no-cook summer dessert (if you buy your meringues). Yumm this sounds perfect for a hot summer day. Now I’ll need to head to the farmers market to find good strawberries. This looks good and totally doable for someone–like myself–who is watching carbs and eating heavy protein. Mmmm…thanks, Deb. I probably would fall into the category of not being to sit in a room with strawberries and cream without eating them. I think the crumble is an inspired idea. Kind of far out take on shortcake. Yum! Love the sound of graham crumbles! How mouthwatering does this look?! Definitely going to give it a try. I love having Pascal turn up in a recipe. Completely unpretentiously. P is sitting alone in a room, quietly reading a book while he eats strawberries and cream with graham cracker crumbles. Definitely looks so good I don’t think I want to eat breakfast — just strawberries and cream with crumbles on top — that’s nutritious isn’t it? ?And I read somewhere to stabilize whipped cream you add unflavored gelatin in it and it keeps a long time. I read that this is what some bakeries do. I haven’t tried it so I can’t guarantee the results. I’ll have to experiment with the sour cream and then the gelatin and write down the results. Great Recipe Deb. Yum! We used to make something like this (strawberries, sour cream, and sugar). I had forgotten about it till now! Graham cracker crumbs would take that dessert to a whole new delicious level! Graham Crumbles are little bits of genius. The tiny wild strawberries are my favorite as well! Although, I can’t seem to find any where I live that are in season as late, when I do though, I’m going to definitely be making this! Oh my goodness, this looks and sounds amazing! I want to make this with the graham flour. Is that the same as graham cracker crumbs or something different? If different, where would I purchase it? I moved to Florida almost a year ago and I miss the Union Square market like crazy! Mostly the tomatoes. They were somehow the best tomatoes I’ve ever had. And I used to make special trips from Queens just for them! Which would of course lead to many other delicious finds! This recipe looks simple, cool & refreshing- just what we need with our million degree heat right now! Thanks as always for reading my mind. I bet this dish tastes lovely as it looks. Might whip this up in my kitchen if I have the time! Why would you want to ignore strawberries and cream? This week was improved by apple ginger pie for breakfast, and fancy pants coffee. so no, quiet with fruit is the best thing in August. I’m totally with you on the crumbles. I made some delightful stawberry ice cream and something about buttery, crispy crumbles puts it over the top! Deb, this sounds soooooooo soooooo good! But being me, I just have to comment on the point about whipped cream seeping into cake: sometimes that’s what’s intended, though using so much that there still is some that hasn’t disappeared into the cake is preferable. I make a plain chocolate cake (really, is there such a thing?) and heavily, thickly frost and fill it with tons of firmly whipped, very slightly sweetened—like 1/2 teaspoon sugar to a pint of—heavy cream. After an overnight in the fridge, the cream and cake have come together in a more-than-the-sum-of-the-parts transformation. It’s like a kiss from your beloved versus a kiss from anyone else. Truly. But now I’m realizing that the addition of a bit of sour cream or creme fraîche would raise the bar even higher! Thank you! I love strawberries and this looks to be a quientensial strawberry dessert! I believe we grow this very strawberry featured, and if I’m not mistaken, judging by photos and your description, the variety of strawberry is Mara des Bois. They are truly perfection! I’ve read that they were bred from a combination of four French heirloom/alpine strawberries to create a completely unique, intense, aromatic delight! They are an everbearing variety, so they may be found May to hard frost, at least in my part of the world. They are particularly spectacular when the weather is cooler. Have you considered adding figs to keep Strawberry company? What a great idea! looks delicious! I normally eat a lit of strawberries, greek yoghurt and honey when strawberries are in abundance. MMMMM Strawberries and cream gilded with crumbs. So jealous of your small normal and I bet sweet as… strawberries. Unlike the “almost” apple like monstrosities they produce in Australia that actually crunch? YUM! The perfect way to munch on fresh ruby red strawberries! If out of whole wheat flour, can I sub with white flour, and if so, how much? All I can say is… YUMMY! But on top of that, you take really good pictures! They definitely bring out the best of your food and I love your writing. This looks just wonderful! I love those little wild strawberries, the flavor is so much more vibrant! I’ll have to pick some up ASAP. Deb, I’m planning some picnic cupcakes that I need to make and transport and am wondering about this stable whipped cream. I normally would just frost with whipped cream on the spot but can’t do it that way this weekend… Do you think this would travel? This is looks delicious! I’ve never worked with whipping cream (versus whipped cream), but I can’t wait to try making this anyway. So simple and looks delicious! This is my kind of dessert. I don’t bake much, in fact I’m a little afraid of it, but I’m changing that this year :) This strawberries and cream recipe is perfect for non-bakers like myself and I love the graham cracker crumble. I can’t wait to try this and with other fruits too, especially with fall coming around. I tried making stabilized whipped cream with gelatin, for a dessert that had to travel. It didn’t work very well, but I don’t know if it’s because I was squeamish and didn’t use enough gelatin, or if it’s a flawed approach. Does adding sour cream stabilize it so that it would hold its shape really well on, say, the top of a pie? Or is it just so it keeps well in the fridge? I would love any insight you have, you have never yet steered me wrong! Teresa — It just holds up well. It may not have the stiffness of the gelatin-set stuff (though I don’t think I’ve tried it before) but it seems to maintain its shape/thickness for days. It should be fine on top of a pie. Unfortunately it appears that the relaxation of the comment filtering has allowed an unauthorized post to get through – currently number 61, from michaeI. This is way more special than I thought it would be- I’ve already made it twice. I did have to cook the crumble for more than was listed, maybe 15 minutes total? well, I’ll have to save this recipe for when strawberry season comes back to FL…not until november! Hi! YUM! Haven’t commented in a while but just wanted to say three things: 1) one of my favorite guilty pleasures is sour cream with brown sugar (or maple syrup). Just love the flavors together, so can’t wait to try this version; 2) Coleen of ColeensRecipes.blogspot.com has a wonderful recipe she calls “Stable Whipped Cream,” in which she adds cream cheese to cream. It is so “stable,” you can even do fancy decorating with it and it generally holds its shape for a few days. I use it on everything, but now am excited to try Nancy Silverton’s version as well! And 3) yours is still my FAVORITE food blog site. I have lots of faves, but yours is the only one I return to over and over and over again. So thanks again for always being there when I need uplifting or a great recpe, Deb! You always make me laugh and your recipes never disappoint! Yes! So many people don’t realize that there are late season strawberries (mid-August until late September) that are some of the juiciest strawberries you will ever taste! Well this looks amazing. Strawberries and cream are so timeless and simple. I have yet to try the “cheesecake” strawberries but I want to! I used the brown-sugar whipped cream to frost a cake this weekend -There were a lot of layers, so I quadrupled the recipe, keeping the ratios the same. The whipped cream held up perfectly as frosting, and everyone was very impressed with the texture. 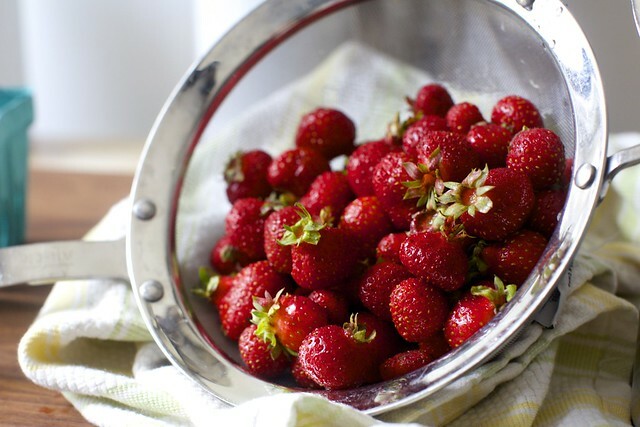 Love new recipies now that strawberries are peaking…thank you! Hi :) Your blog is one of my favorites, and this post looks so delicious! I am actually a teen blogger, and love looking at your photos for something to aspire towards. I just posted about creme puffs, if you want to check it out! Homemade graham crumbles?! YUM! Sign me up, those strawberries are perfection! Like a fruit crumble, but with fresh fruit instead of cooked. Brilliant. By the way, I played around with Valerie’s Chocolate Cake (your fluffed up version) on my blog post this week. Magnifique! Merci for the recette. My daughter has somehow just realized the glory that is whipped cream and now requests it on everything. I’m sure if I offered to put it on fruit she would not resist, especially if there were also cookies involved. Yum!! I am actually thinking of starting a food blog myself, mostly because I want a reason to try out new things/food. I was wondering how you got started and whether you have any tips. What a great looking desert and a great idea with graham crumble!! What do you think about this whole combo on top of oatmeal? I was looking for an oatmeal cream brûlée recipe but this looks like an alternative. My sisters and I are going to hawaii and renting a condo and I want to do a few breakfasts. I’m gonna make it, thanks! I cant wait to make this! AND make it gluten free! I’m so excited! I’ll let you know how the graham crumbs turn out! Thanks SK YOU always have something delicious up your sleeves! I made this last week and it was superb. since I had a batch of brown butter in the fridge, I subbed it for the butter in the crumble. a brown butter biscuit crumble? I hope you approve! Hey Deb! 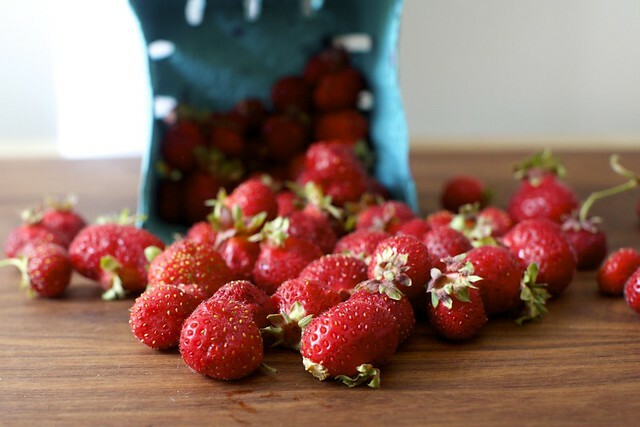 For ‘transcendent’ strawberries come to Oregon in May! The berries are simply divine. There’s still time to book a flight. If I wanted to substitute ground up graham crackers for the crumble, which ingredients would that replace? Everything but the butter, sugar, and honey? I’m not sure because they are going to work much different in a recipe. 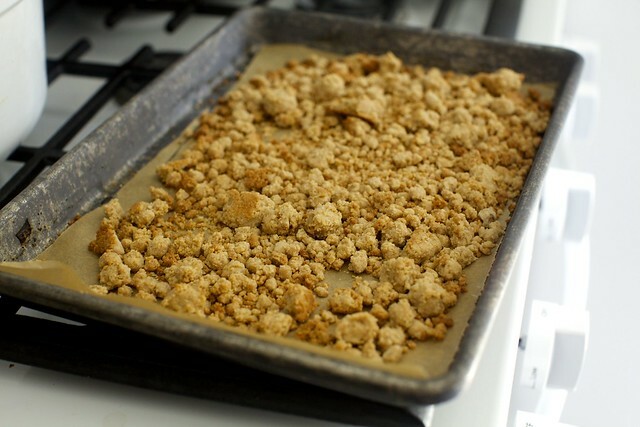 You might use this gingersnap crumble instead as a template for the crumb, using grahams instead, should work fine.